BACKGROUND AND PURPOSE: The management of wide-necked aneurysms or aneurysms with a neck-to-body ratio close to 1 is a difficult challenge for the interventional radiologist because of the risk of coil migration or coil protrusion into the parent vessel. Our objective was to evaluate the efficacy and safety of balloon-assisted coiling as well as the follow-up results of occlusion for those difficult aneurysms in which conventional treatment with Guglielmi detachable coils (GDCs) had failed. METHODS: A nondetachable balloon was used in 49 procedures performed in 44 patients (35 women and nine men) who underwent GDC coiling of aneurysms. Every aneurysm had either a wide neck or a sac diameter/neck size ratio (SNR) of 1.5 or less. RESULTS: In four (8%) of the procedures, balloon placement failed, leaving a total of 45 aneurysms treated with balloon-assisted coiling. Final results consisted of total occlusion in 30 cases (67%), subtotal occlusion in 11 cases (24%), and incomplete occlusion in four cases (9%). We found a correlation between the diameter of the sac and the occlusion rate, but not between the size of the neck or the SNR and the occlusion rate. Two thromboembolic complications occurred, but neither had clinical consequences. No aneurysmal rupture was observed during treatment. Final angiographic follow-up time ranged from 3 months to 5 years (mean, 16 months). CONCLUSION: Balloon-assisted coiling is an important adjunct in the treatment of aneurysms with a wide neck or low SNR. In our experience, this technique allowed safe and efficient treatment of aneurysms when conventional GDC treatment had failed. Endovascular treatment of intracranial aneurysms with Guglielmi detachable coils (GDCs, Target Therapeutics, Fremont, CA) has become an important and well-known alternative to surgical clipping (1–3), allowing coil replacement in the aneurysmal lumen. Nevertheless, wide-necked, or broad-based, aneurysms with a maximal sac diameter/neck size ratio (SNR) of close to 1 are still difficult to embolize because of the risk of coil migration or coil protrusion into the parent vessel (4). Such aneurysms also pose a risk for surgical clipping (5). 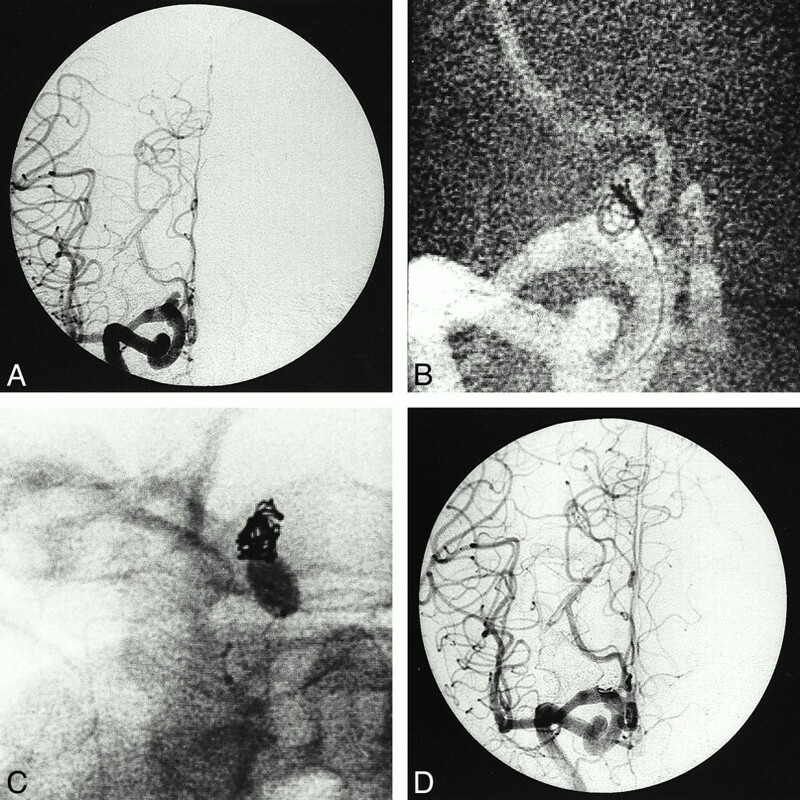 In 1994, Moret et al (6) described a technique for the treatment of these difficult aneurysms in which a temporary, inflated balloon is placed in front of the aneurysmal neck during each coil placement. The objective of the present study was to evaluate the efficacy, safety, and follow-up results of that technique in the occlusion of wide-necked aneurysms or aneurysms with an unfavorable SNR in which conventional GDC treatment had failed. From June 1994 to September 1999, 49 balloon-assisted coiling procedures were performed in 44 patients (five patients were treated twice). The procedure was performed by experienced neuroradiologists in five different medical centers. Clinical data and angiograms were reviewed retrospectively in all cases. The group of patients comprised 35 women and nine men, ages 21 to 71 years. One patient had two aneurysms (balloon-assisted coiling was used for one aneurysm and conventional GDC treatment was used for the other one, during the same procedure) and another patient had seven aneurysms (only two of which were treated with balloon-assisted coiling, in two different procedures). Twenty seven patients (61%) presented with subarachnoid hemorrhage (SAH) caused by aneurysmal rupture. Nineteen patients (70%) were grade 1 on the World Federation of Neurological Surgeons scale, three were grade II, four were grade III, and one was grade IV. In 13 cases (30%), the aneurysm was asymptomatic. Three patients had a mass effect associated with visual disorders. In another case, a false aneurysm had arisen from the impaired internal intracavernous carotid artery after hypophyseal surgery performed via a transrhinoseptal approach. For each patient, treatment decisions were made in consultation with the neurosurgery and neuroanesthesiology teams. In all 49 cases, balloon-assisted coiling was used after conventional treatment with GDCs had failed (Fig 1). In 16 cases, balloon-assisted coiling was the second treatment: eight after conventional treatment (Fig 2), five after balloon-assisted coiling, and three after incomplete surgical clipping. A, Anteroposterior right carotid angiogram shows a broad-based aneurysm at the termination of the internal carotid artery. B, Digital radiograph shows failed attempt to treat the aneurysm with conventional coiling owing to bulging of the coil into the parent artery. C, Digital radiograph shows that latex balloon glued onto a Magic microcatheter is temporarily inflated in the parent artery at the level of the aneurysmal neck. Several coils have been positioned through the microcatheter placed in the aneurysm. Additional coils have been delivered to achieve occlusion. D, Final angiogram at the end of the procedure shows occlusion of the aneurysm. 60-year-old woman. A, Cerebral angiogram (lateral projection) 1 month after partial occlusion of a ruptured wide-necked carotid-ophthalmic aneurysm performed emergently with a conventional GDC procedure. Remaining pouch has a triangular shape with a broad neck. B, The first coils have been inserted into the aneurysm with the balloon inflated and bridging the aneurysmal neck. C and D, Cerebral angiograms, lateral (C) and anteroposterior (D) projections, show complete occlusion of the aneurysm. Locations of the aneurysms are given in Table 1. 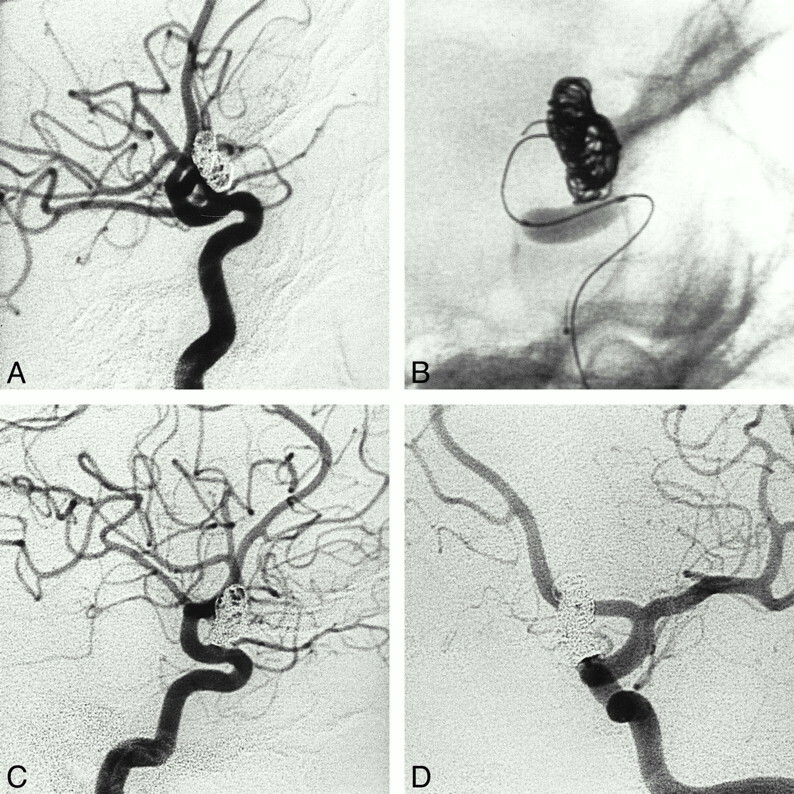 Thirty-nine (89%) of 44 aneurysms were ocated in the internal carotid artery, three in the anterior communicating artery, and two in the basilar artery (Fig 3). All measurements were made on diagnostic angiograms using either an internal or external reference. In the first case the (known) size of the internal carotid or basilar artery was compared with the size of the aneurysmal sac and neck (7). In the second case, an external object (such as a coin) was taped to the patient's skin and included in the angiogram. The maximum diameter of the sac, the size of the neck, and the SNR were measured for each aneurysm. A, Cerebral angiogram (anteroposterior projection) reveals a large, wide-necked basilar artery tip aneurysm. Patient was not a candidate for surgery, and treatment with GDCs was impossible without using a protection balloon placed in front of the aneurysmal neck during coil deployment. B, Digital radiograph shows the Solstice catheter has been advanced through the left vertebral artery, with the microwire anchored in the left P1 segment. After deployment of the coil into the inferior part of the aneurysm, and before its detachment, the balloon bridging the aneurysmal neck was slowly deflated. C, Cerebral angiogram at the end of the procedure shows subtotal occlusion of the aneurysm. The right P1 segment is occluded, but the posterior cerebral artery is fed by the right posterior communicating artery. No neurologic deficit is observed. D, Cerebral angiogram 15 months after treatment shows stability of the occlusion. All embolizations were performed with the patient under general anesthesia and via a bifemoral approach. Heparin was administered as soon as the introducer sheath was inserted, first as a 5000-U bolus then followed by a continuous infusion to achieve an activated clotting time of more than 120 seconds. In some of the medical centers, 250 mg of aspirin was given intravenously, except for patients treated 15 days after the rupture. The heparin level was maintained on an anticoagulation basis (two to three times baseline) for 48 hours, followed by a low-molecular heparin treatment for 1 week. Catheterization was performed with either a Tracker 10 or 18 catheter (Target Therapeutics); in all cases, the aneurysm was embolized with a GDC 10, although in eight cases, a GDC 18 was also required. The technique has been described previously (8). Briefly, we used a nondetachable balloon glued onto a Magic catheter (no. 1 Balt Extrusion, Montmorency, France) or a premounted Cirrus/Solstice balloon catheter (MIS, Sunnyvale, CA), which was placed in front of the aneurysm neck under road mapping. Then, the microcatheter for GDC deployment was placed in the sac of the aneurysm. The coil was deployed in the aneurysm while the balloon was inflated temporarily, occluding the aneurysmal neck and parent artery. The balloon was then deflated to check the coil stability. If the coil did not move, the balloon was detached. This process was repeated until the aneurysm had been embolized as well as possible. The aneurysm was considered totally occluded angiographically when the sac and the neck were densely packed, subtotally occluded when the sac was packed but a small neck remained, and incompletely occluded in case of persistent opacification or loose packing. Usually, angiographic and clinical follow-up was performed 3 months, 15 months, 3 years, and 6 years after the procedure (with some differences among the medical centers). The angiographic results were evaluated by a consensus of two neuroradiologists. The occlusion rate on the last angiogram and the largest diameter of the aneurysmal sac, the size of the neck, and the SNR were tested by means of a nonparametric Kruskal-Wallis test using quantitative data. A correlation test was used to compare the largest diameter of the aneurysmal sac with the size of the neck on the pretreatment angiogram. Statistical significance was assumed at the level of P = .05. Aneurysms were embolized in all cases; however, in four cases (8%) balloon placement failed. In two of the failed cases, it was impossible to insert the microballoon in front the neck of the aneurysm because of the tortuosity of the cervical vessels (n = 1) or because of the acute angle of the parent (posterior communicating) artery to the internal carotid artery (n = 1); in the other two, the balloon ruptured during the procedure and no others were available at the time of treatment. In three of these cases, subtotal occlusions were obtained with loose packing at the neck; in the fourth case, total occlusion was achieved but protrusion of the coil into the parent vessel necessitated prolonged anticoagulation. In the 45 aneurysms treated with balloon-assisted coiling, occlusion was considered total in 31 cases (69%), subtotal in 13 cases (29%), and incomplete in one case (2%) at the end of the procedure. All aneurysms were followed up angiographically, except in one patient who died a week after SAH without rebleeding. The final angiographic examination was performed 3 to 6 months (n = 21), 12 to 15 months (n = 11), 2 years (n = 1), 3 years (n = 6), 4 years (n = 3), or 5 years (n = 2) after treatment (mean angiographic follow-up, 16 months). Of the 31 initial total occlusions, 28 (90%) remained stable at final follow-up. 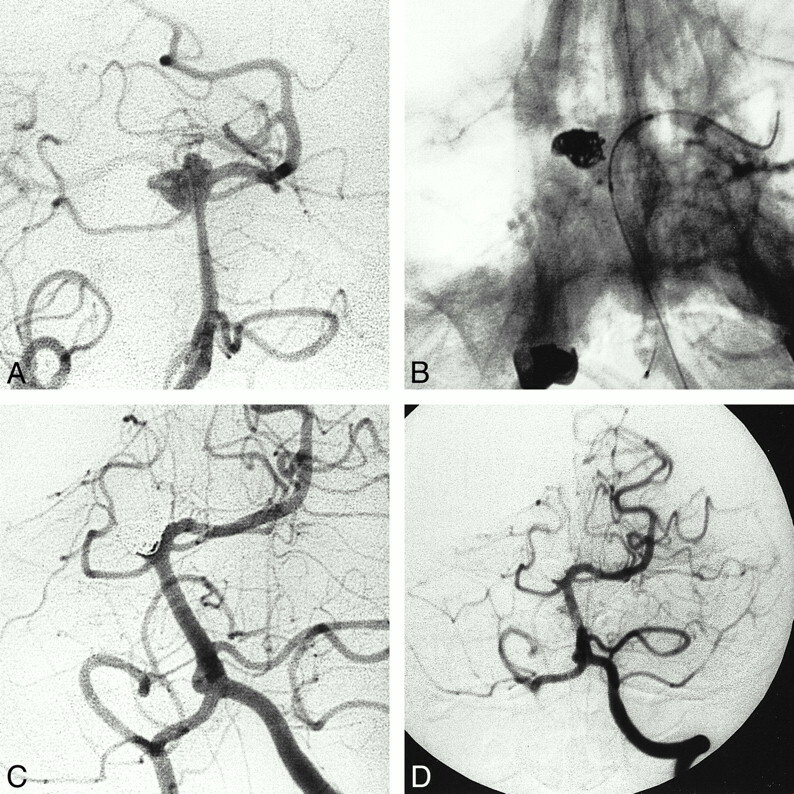 In three aneurysms (10%), control angiograms showed recanalization by coil compaction (two subtotal occlusions and one partial occlusion). Among the 13 initial subtotal occlusions, control angiograms showed no modification in nine cases (69%). In two of the initially subtotally occluded aneurysms, one became totally occluded and two displayed regrowth of the remnant. In the one initially incomplete occlusion, angiographic evaluation showed no change. Five residual pouches were retreated with a temporary balloon-assisted technique (the second procedure was considered as a new procedure). Final results were based on the percentage of aneurysms that were totally, subtotally, or incompletely occluded on the last follow-up angiogram or, in the case of the patient who died a week after SAH, at the end of the procedure. Thirty (67%) of the 45 balloon-coiled aneurysms were totally occluded, 11 (24%) were subtotally occluded, and four (9%) were incompletely occluded (Table 2). Table 3 shows the occlusion rate according to the largest diameter of the sac on the final angiogram. In general, the smaller the sac diameter, the better the occlusion rate (P = .05). Table 4 shows the occlusion rates on the last angiograms according to the size of the neck. There was no statistical correlation between occlusion rate and neck size (P = .15). Table 5 shows the occlusion rates on the last angiograms according to the SNR ratio. There was no statistical correlation between occlusion rate and SNR ratio (P = .07). There was a strong correlation between the largest diameter of the sac and the size of the neck (P < .0001). We did not observe any rebleeding of the ruptured aneurysms or bleeding of the unruptured ones. One patient, with an ophthalmic-carotid aneurysm, experienced a clot in the middle cerebral artery that occluded some of the parietal branches. A hyperselective perfusion of urokinase allowed incomplete recanalization, and upon waking, the patient was asymptomatic. Another patient, with total occlusion of an intracavernous aneurysm, experienced transient hemiplegia (lasting a few minutes) upon waking after extubation at the end of the procedure. Heparin, which had inadvertently been reversed at the end of treatment, was reinfused immediately, and findings at angiographic follow-up were normal. No permanent complications could be attributed to the technique, and no aneurysmal rupture occurred during treatment. The aim of endovascular treatment with GDCs is to achieve complete and stable occlusion to prevent any bleeding or rebleeding. Subtotal packing does not properly protect the aneurysm from rupturing, even if the aneurysm has not ruptured previously (9–11). Stable occlusion relies on the density of the initial packing (2, 11, 12); loosely packed aneurysms have a high rate of recanalization, because of coil compaction (13): the denser the coil packing, the less the chance for recurrence of an aneurysmal lumen or neck. Previous investigators have reported that the best angiographic results (complete occlusion) are obtained when the aneurysm is small and narrow-necked (2, 7, 11, 12, 14, 15). In a study by Zubillaga et al (7), total occlusion was obtained in 85% of cases when the neck was less than 4 mm, but only in 15% of cases when the size of the neck was greater than 4 mm. Others (15–17) have underlined the importance of the SNR. An SNR of 2 or greater is the most favorable situation for GDC treatment. Conversely, when the ratio is close to 1, coil migration into the parent vessel is difficult to avoid. In wide-necked aneurysms (in absolute or relative terms in relation to the size of the sac), dense packing at the level of the neck is difficult to obtain without impairing the parent artery. Therefore, there is an increased risk of parent vessel thrombosis (8, 13). In these difficult aneurysms, neither conventional GDC treatment nor surgery is satisfactory, so it is essential to continue to look for new endovascular techniques that can increase the occlusion rate of such aneurysms (18). In our study, inflation of the balloon in the parent vessel during coil placement allowed 45 aneurysms to be treated when conventional treatment failed owing to a helix bulging into the parent artery. In four (8%) of the cases, balloon placement failed: in two instances because it was impossible to insert the microballoon in front of the neck of the aneurysm, owing to either tortuosity of the cervical vessels (one case) or the acute angle between the parent (posterior communicating) artery and the internal carotid artery (one case), and in two cases because the use of a balloon was abandoned after it was perforated during the procedure and no other balloons were available at the time of treatment. Flow-dependent catheters do not have the stability and directionality of an over-the-wire system and therefore provide less stable and accurate balloon positioning across aneurysmal necks. The latter device, however, does not provide the proximal pushability and distal trackability of the microcatheter for GDC deployment. Unfortunately, the nondetachable Cirrus/Solstice silicone balloon used in the present study has been removed from the market, but several companies will be releasing suitable replacements in the near future. Occlusion at follow-up was total in 67% of the cases, subtotal in 24%, and incomplete in 9%. The rate of complete angiographic embolization is comparable to previous results published by Moret et al (8) and Lefkowitz et al (19). Our results revealed a correlation between sac diameter and rate of occlusion. The larger the aneurysm, the lower the possibility of dense packing in the sac and at the neck (8). Coil compaction is more likely to occur in the long term when there is a large sac (18). We found no statistical relationship between neck size and occlusion rate, nor did we find a significant relationship between occlusion rate and SNR. The SNR plays a sizable role in determining the feasibility of conventional GDC treatment (8, 16). The inflated balloon reduces the contact surface between the aneurysm and the parent vessel lumen, artificially improving the SNR. Among the initially totally occluded aneurysms (n = 31), the angiographic results were stable in 90%. In the group of subtotally occluded aneurysms at the end of the procedure (n = 13), angiographic follow-up showed modifications in 31% (n = 4). In two of these four cases, recanalization with coil compaction necessitated a second treatment. In the other two, total occlusion was observed. In the case of the initially incomplete occlusion, angiographic evaluation showed stability of the occlusion. The rate of recurrence of these wide-necked or badly shaped aneurysms was no different from the rate observed with berry aneurysms occluded with conventional GDC treatment (20). Thromboembolic events constitute the main complications of GDC treatment (8, 18), and, indeed, two thromboembolic complications occurred in the present study. In one case, an intraarterial thrombus developed during the procedure. This patient was treated with intraarterial thrombolysis and experienced no clinical sequelae. In the second case, transient hemiplegia occurred immediately after the procedure. Heparin, which had inadvertently been reversed at the end of treatment, was reinfused, and clinical and angiographic follow-up findings were normal. Balloon-assisted detachable coiling increases the potential risks of thromboembolic complications, owing to 1) the use of two microcatheters in the artery, 2) temporary occlusion of the parent artery, and 3) repeated inflations and deflations of the balloon, which may lead to intimal injury (8, 19). In wide-necked aneurysms, a large surface of the coil packing is exposed to the bloodstream, creating a higher risk than in narrow-necked aneurysms (18, 19). Large doses of heparin are thus mandatory throughout the procedure, followed by an efficient perfusion for 48 to 72 hours afterward. The balloon must be inflated before the coil is placed. And it is important not to inflate the balloon once a helix is protruding into the parent artery, because this would greatly increase the risk of rupture (21). Very dense packing is unlikely to cause an aneurysm to rupture if the technique is properly performed (22). In addition to the usual complications involved in GDC treatment, the following complications may arise from inflation of the balloon: cerebral ischemia induced by prolongation of balloon inflation, dissection, vasospasm, perforating artery occlusion, and an endothelial lesion, which may potentially cause stenosis (13). Balloon-assisted coiling is therefore recommended only after conventional treatment has failed. Balloon-assisted coiling offers the following advantages in the treatment of aneurysms: 1) the balloon prevents the coil from bulging into the parent artery during coil deployment, 2) the balloon stabilizes the microcatheter in the aneurysm during coil delivery, 3) the coils are molded on the balloon, avoiding any protrusion into the parent vessel, and 4) the balloon allows dense packing at the neck level (8, 19, 22). Balloon-assisted detachable coiling is an important adjunct in the treatment of aneurysms with wide necks or a low SNR. In our experience, this technique allowed safe and efficient treatment of aneurysms when conventional GDC treatment had failed. We are grateful to P. Bertrand for his assistance with statistical analysis and to S. Charton for her help in preparing the manuscript. ↵1 Address reprint requests to J. P. Cottier, MD, Service de Neuroradiologie, CHU Bretonneau, 2 Bd Tonnelé, 37044 Tours, Cédex, France. Angiographic Follow-Up of Cerebral Aneurysms Treated with Guglielmi Detachable Coils: An Analysis of 162 Cases with 173 Aneurysms.